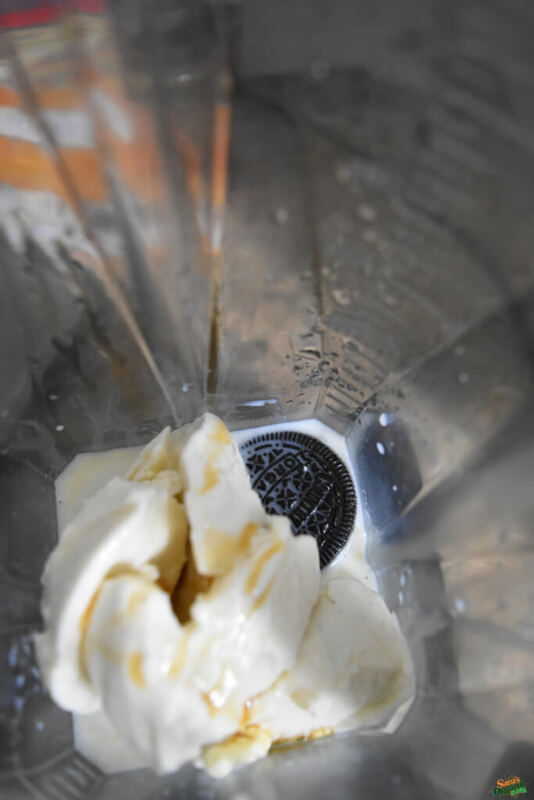 Who doesn’t love a good Oreo milkshake? For those of you who do not know, there is an organic version of an Oreo or “chocolate cookie sandwich” out on the market. They taste just as amazing, if not better! The brand I use is Country Choice Organic Chocolate Sandwich Cookies. They are one of the few brands that produces an organic version of an Oreo. 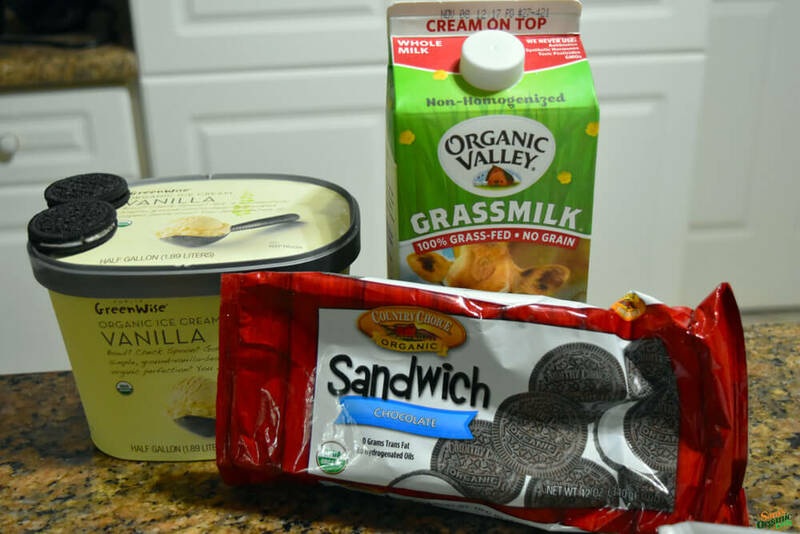 This brand is certified organic, kosher, and Vegan. These chocolate sandwiches do not contain artificial flavors, trans fats, hydrogenated oils or unrecognizable ingredients. Today is Halloween, so I decided to make an organic Oreo milkshake. I put it in my skull mason jar as one of my treats today. Halloween is all about the treats, sweets, and chocolate. 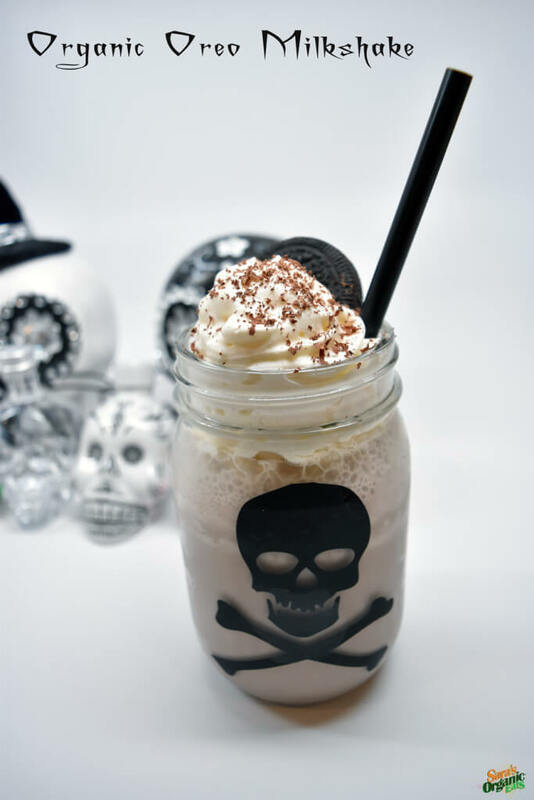 What better way to celebrate, then with a homemade Oreo milkshake with ingredients that won’t scare the ghouls and goblins out of you. Place all ingredients in blender with a handful of ice. Blend for 2-3 minutes until smooth consistency. Feel free to add more ice cream or milk in between if you want your shake thicker (Ice Cream) or Looser (Milk). Top with which ever garnish you choose. I hope you enjoy this wonderful tasting Organic Oreo Milkshake and have a Happy Halloween! Halloween, which is one of my favorite fall holidays, is quickly approaching us. Halloween is all about the costumes, the parties, the pumpkins, the scary movies, the haunted houses, the tricks, but most importantly the treats. What is the one thing on every child’s mind on Halloween? How much candy will they receive. Most candy children receive is filled with chemicals, GMO’s, artificial flavors, artificial colors, high fructose corn syrup, and ingredients you can’t pronounce. 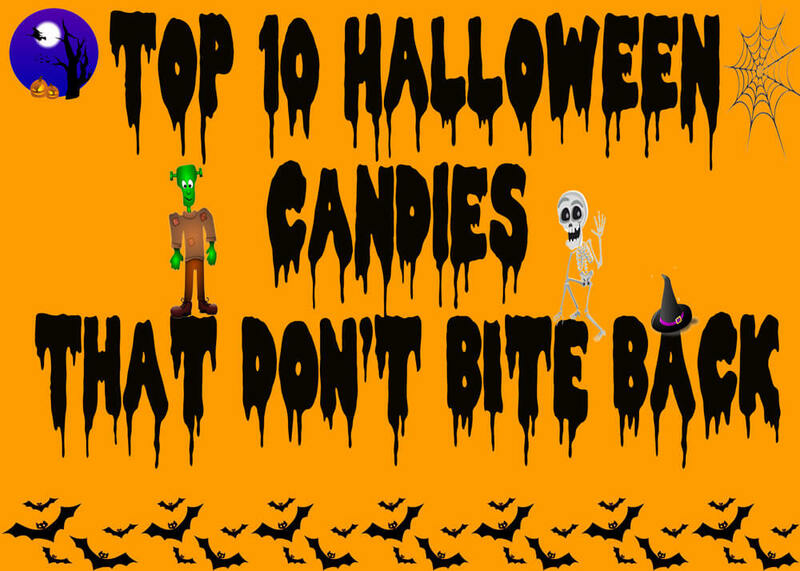 Even us adults want some candy that we don’t feel as bad eating. I am here to tell you that there is a world full of wonderful Halloween candies that don’t bite back. 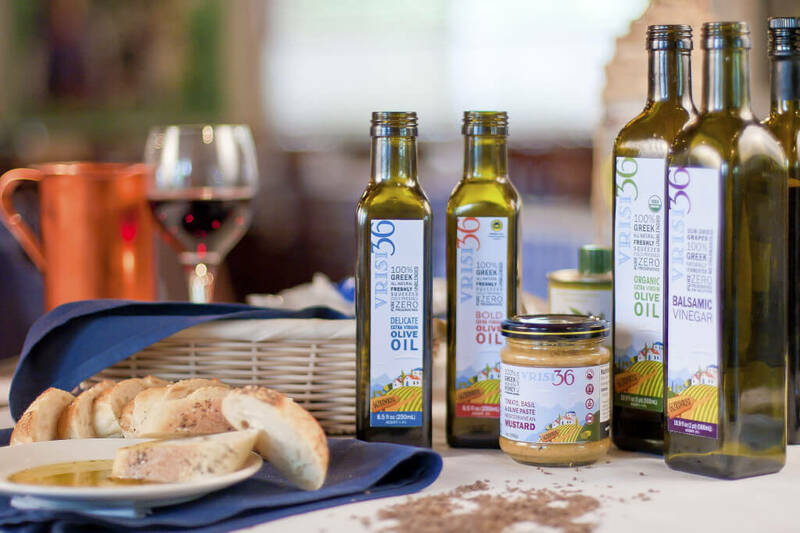 Vrisi 36, a brand line imported by parent company Flying Olive Farms produces Greek olive oil, balsamic vinegar, and other Greek specialty products. Vrisi 36’s products are produced in the Lakonia and Messinia region of Greece. Vrisi 36 offers the most authentic Greek olive oil that you can find on the market. They pick the olives off the trees and within 24 hours they are cold press and packed in the bottle. You get the “farm to bottle” service, which is the way olive oil should be produced. This process allows their olive oils to stay pure, which you can taste when you try Vrisi 36’s Extra Virgin Olive Oil. Their quality just cannot be matched. Unlike other olive oil companies, Vrisi 36 tests the amount of polyphenols in their olive oil. Polyphenols are the reason many consume olive oil as it has been researched to fight diseases. The sad truth is that recent research has shown that most olive oils on the shelves today do not contain polyphenols and most are not even olive oil as they claim. You can be assured that you are getting high quality olive oil with all the benefits still in tact. 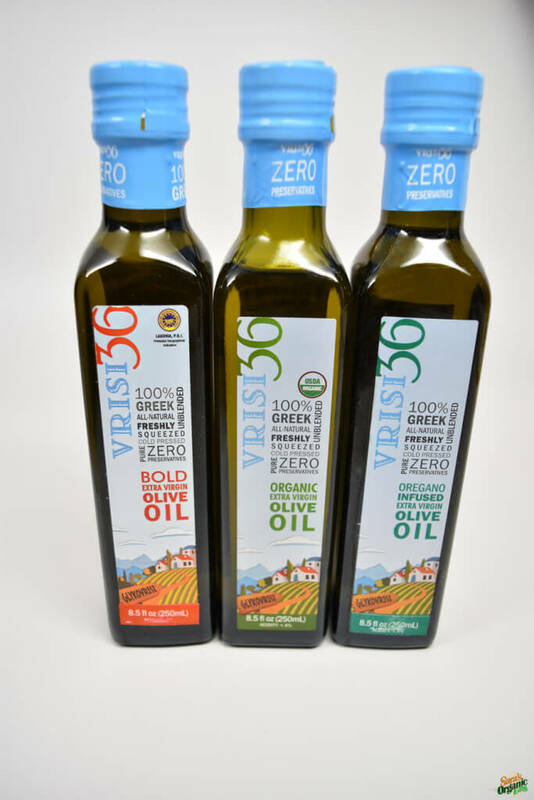 All of Vrisi 36 ‘s olive oils are Non-GMO, all natural, unrefined, cold pressed, and do not contain preservatives. They also carry organic and kosher certified olive oil in their line as well. Vrisi 36 has a unique line of balsamic vinegar. They are one of the very few companies to use the Corinthian Grape, better known as currants, to produce their balsamic vinegar. As a result, the balsamic vinegar has a sweet taste, a strong red color, and is left with nothing but antioxidants. Their balsamic vinegar is Non-GMO and contains no sulfites or artificial colors or flavors. Vrisi 36 carries their balsamic vinegar in both organic and natural. Flying Olive Farms, which is the import company of Vrisi 36 is located in Raleigh, North Carolina. Along with their brand line Vrisi 36, they also import other Greek specialty products. One of their most popular is a beverage called Mastiqua, which is sparkling water that contains Mastiha. Mastiha is a tree resin that comes from the Mastic tree. Mastiqua is a health drink that helps with digestion and oral health. It is also known to have anti-inflammatory and anti-microbial benefits. This beverage comes from the Chios Island in Greece. Flying Olive Farms also imports a variety of the most sought out wines from the Monemvasia Winery. 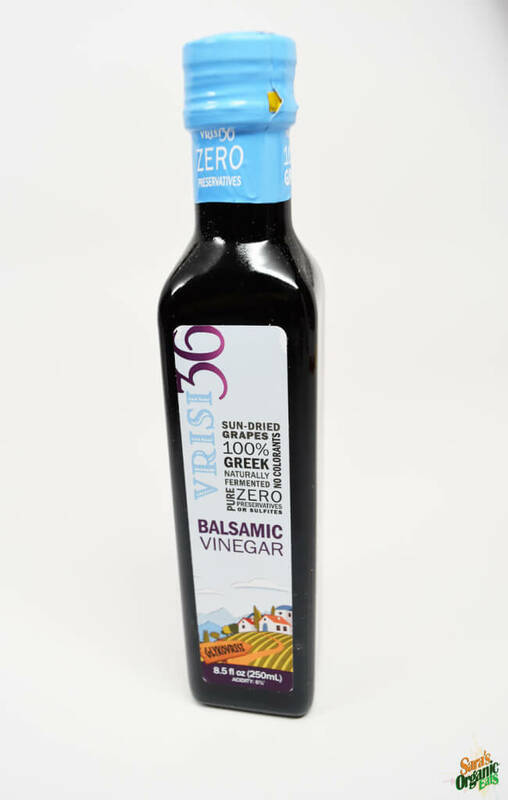 Also part of the Vrisi 36 brand is Mediterranean Mustards that are made with the brands’ olive oils and balsamic vinegar. You get a pure taste of the Mediterranean when you use the mustards. The best part is that it is made without any processed chemicals and only ingredients you can pronounce. Vrisi 36 partnered with celebrity chef Diane Kochilas who created amazing Greek recipes using Vrisi 36 products. Please visit http://www.dianekochilas.com/greek-recipes/ to bring a taste of Greece to your dinner table using only the finest Greek products. I highly recommend all of you to try any of Vrisi 36’s and Flying Olive Farms products. 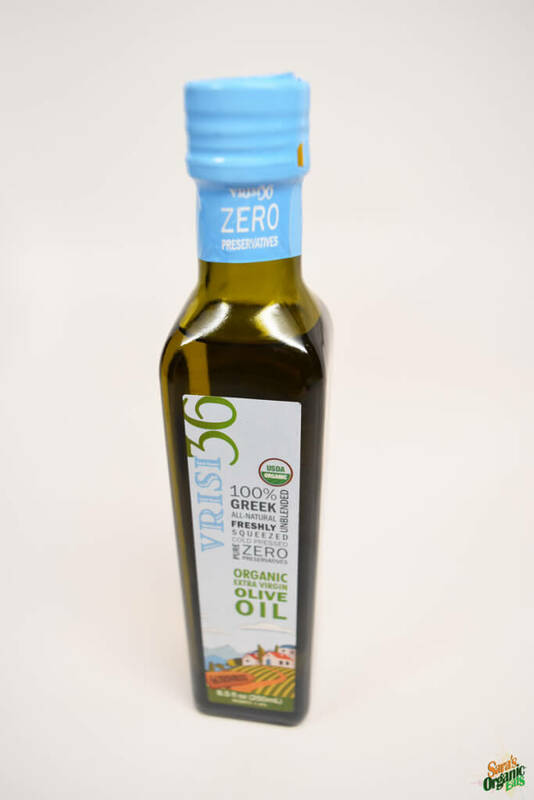 There is no other company out there that truly gives you the authentic taste of Greece with the highest amount of health benefits than those of Vrisi 36 and Flying Olive Farms. I hope you enjoy the taste of Greece without ever having to leave the dinner table. *Disclamer: All images in this post are the sole property of Flying Olive Farms unless the images contain the Sara’s Organic Eats Logo. 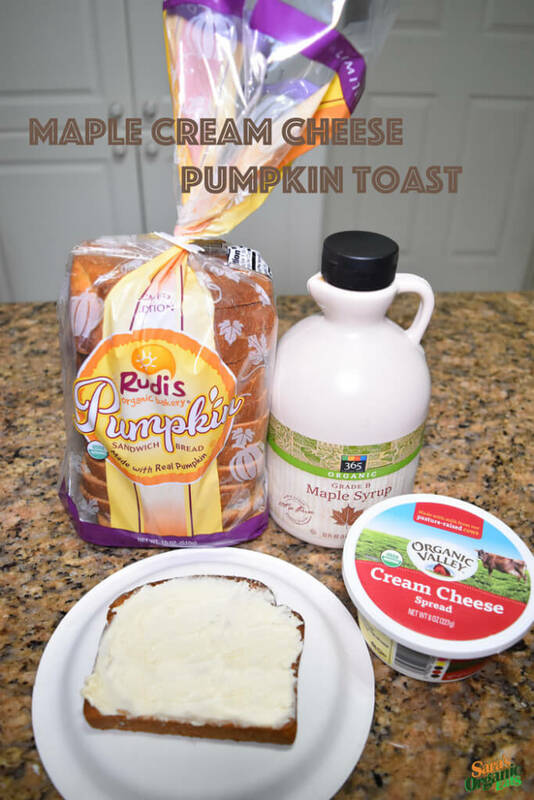 As you read in my recent blog post, I discovered Rudi’s Pumpkin Sandwich Bread and came up with this recipe for maple cream cheese pumpkin toast. I love putting cream cheese on my toast and adding the maple gave it a sweeter flavor. I also love using maple syrup for everything as it also makes a great sweetener with a yummy flavor. Whenever you use maple syrup, I highly recommend you using Grade B a.k.a Dark Amber which has a stronger maple taste. This recipe is so easy to make and it has every ingredient of fall time all in one delicious breakfast item. This recipe is for one serving but it can easily be doubled or tripled. You can make this recipe for breakfast or it can be enjoyed as a snack. First, lightly toast the bread. As it is toasting, take 1 tablespoon of cream cheese and put it in a small mixing bowl along with 1 teaspoon of maple syrup. Mix until smooth consistency. Once the toast is done take it out of the toaster and let it sit for a minute or 2 to cool down. Lastly, spread the cream cheese on your toast. feel free to use either Grade B or Grade A maple syrup as long as it is organic and real maple. Also, feel free to sprinkle pumpkin spice or cinnamon on top of the cream cheese. I hope this satisfies your fall pumpkin obsession cravings. Yesterday I went to Whole Foods Market in Fort Lauderdale and I found Rudi’s Pumpkin Sandwich Bread for the first time on the shelf in the bakery section. Without hesitation, I put it in my shopping cart. It is Organic, Vegan, Non-GMO, Kosher, and made with real pumpkin and recognizable ingredients. There are fourteen slices of pumpkin bread in the package. Also, you can smell the pumpkin spice without opening the bag. This morning for breakfast, I made maple cream cheese and topped it on my toasted pumpkin bread (I will post the recipe soon 🙂 ). It was so delicious and tasted like fall time which is non-existent in South Florida. For those of you who are obsessed with pumpkin, you will love this delicious pumpkin sandwich bread. You can top this bread with cream cheese, butter, butter substitute, coconut butter, maple butter, or anything you desire. This would also make a fantastic pumpkin french toast or even a classic Thanksgiving sandwich. 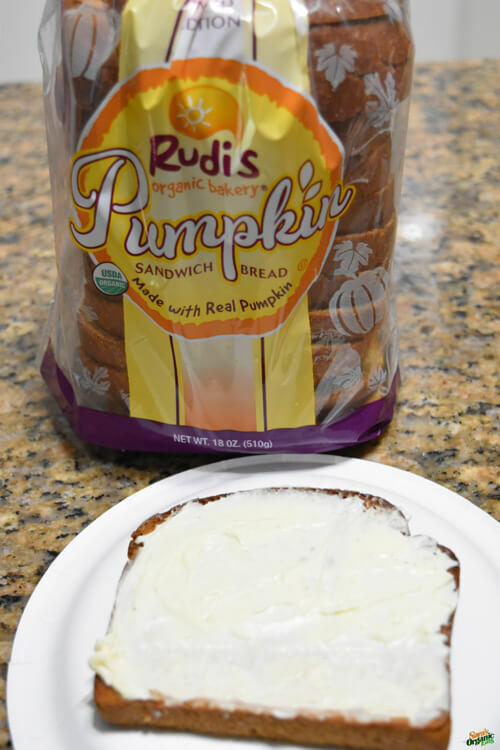 There are so many amazing recipes you can make with Rudi’s Pumpkin Sandwich Bread. I will experiment some other recipes with the pumpkin bread so that I can share it will all of you. 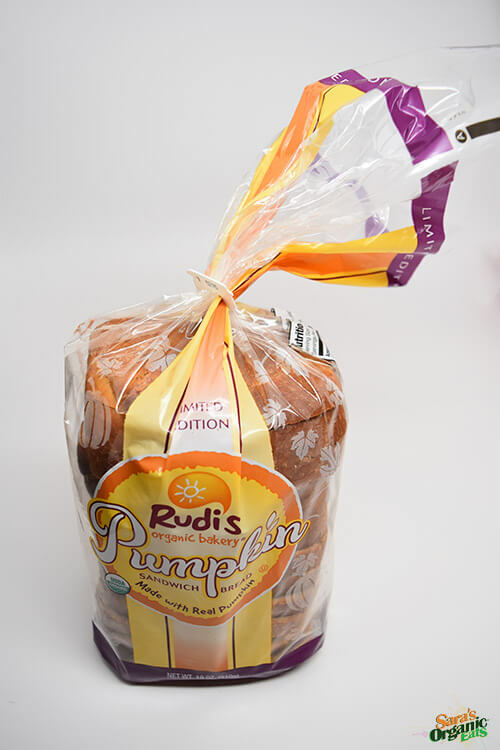 You can find Rudi’s Pumpkin Sandwich Bread at your local Whole Foods Market and local organic markets. Please visit https://www.rudisbakery.com for more information and locations on where you can buy their amazing organic bread products. 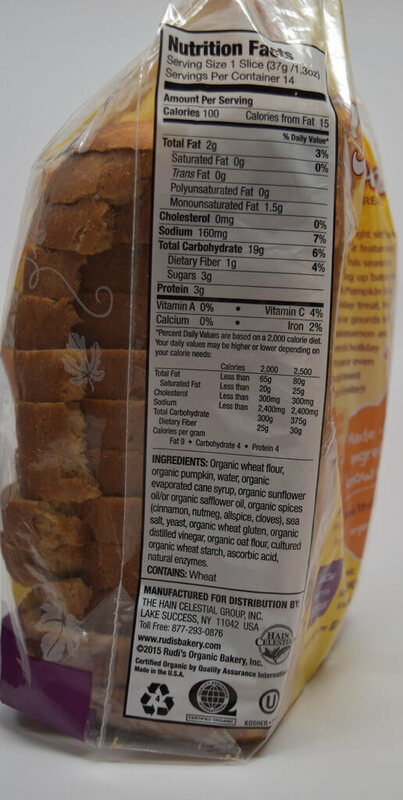 Below is the Nutrition Facts and Ingredient list. I hope you enjoy Rudi’s limited edition pumpkin sandwich bread and taste what fall is all about, bite after bite.